Daytripper365 is excited to share a second dispatch from Africa from Greg Lederle, founder of the boutique travel agency Lederle Safaris. (See Greg’s first post here.) On a recent privately guided trip in Botswana, Greg came across a unique sighting involving an African Rock Python, a Martial Eagle and an unfortunate Egyptian Goose. Here he transports us all to the 320,000-acre Selinda Reserve, describing the scene with his typical infectious passion and love for the African bush. On this magical continent you never know what you will see when you set out on a game drive. Lederle Safaris creates unique itineraries in Africa, tailored to your individual tastes and desires—say fly-fishing for tiger fish in the Zambezi or gorilla trekking in Rwanda. Greg and his wife Riana will arrange everything-- all your travel details from flights, transfers, accommodations—everything! You just have to get to Africa and then all is expertly taken care of till your flight back home. Greg or one of Lederle Safaris guides can also accompany you on privately guided trips providing for the best wildlife experiences on the continent. With roots set firmly in Africa, and a combination of over 25 years in the business the team at Lederle provides the very best in luxury travel to Africa. Greg: We were tracking a pride of lions on an early morning game drive in the Linyanti region in Botswana when we spotted a Martial Eagle on the ground. We stopped immediately and knew straight away that these rapacious raptors only come to ground in the event of a kill. Once I glassed over the eagle with my binoculars it was apparent that the raptor wasn’t in the process of killing anything, but was watching an African Rock Python 15 yards away constricting an adult Egyptian Goose. The goose was still very much alive. Looking through our binoculars, we could see how with each breath the goose took; the python was slowly tightening its grip; squeezing the life from the unfortunate goose. I explained to my clients that with an increased lung surface area that killing it may perhaps take a little longer when compared to constricting a mammal of the same size. Meanwhile, the Martial Eagle was keeping a very close eye on the snake’s progress, as well as looking around a great deal. Despite its prowess as one of the most powerful eagles on the African continent, it is still vulnerable on the ground, especially if a large Caracal or even a Leopard was in the area – both of which occur in good numbers in the Linyanti. Due to the sighting being so rare and not wanting to disturb either the Martial Eagle or the Python (I doubt the goose was concerned at this stage…), we pulled back a little and positioned the vehicle to allow these incredible events to unfold as naturally as possible. 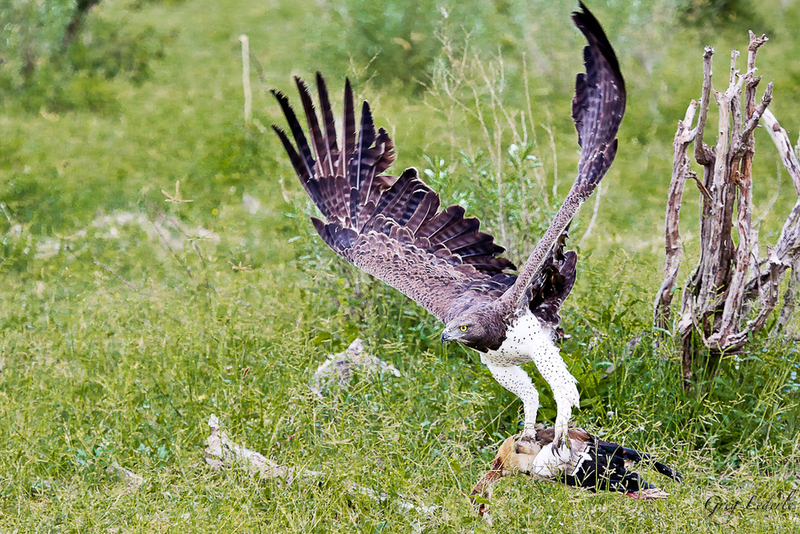 The Martial Eagle’s target was to get its talons on the goose, as the python is a tough opponent and could prove fatal to the eagle as well. The eagle flew from one spot to another to gain a better view or, perhaps to allow the snake to see her. The python, having very good vision, saw the eagle and realized that it was better to abandon the goose and avoid potential conflict. Quietly we watched as the snake sought shelter in a nearby wild sage thicket, giving up its prey. 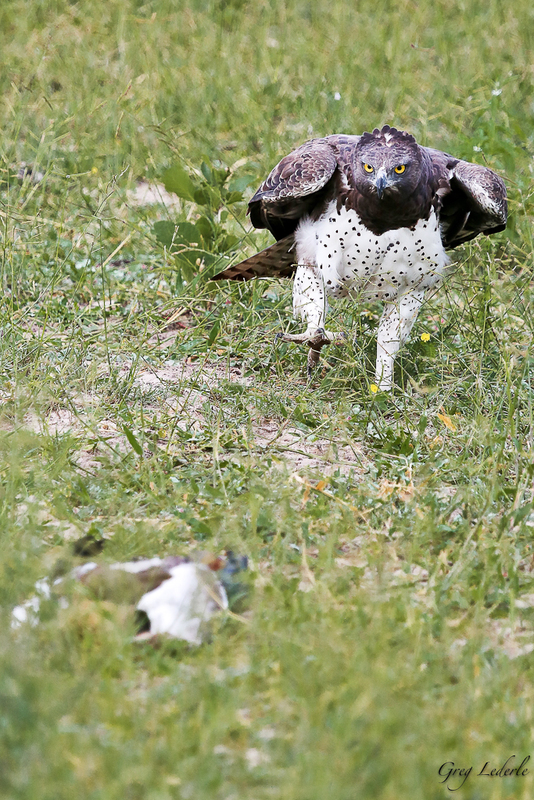 It was at this point that the Martial Eagle made her move, carefully making her way to the now lifeless goose lying on the ground, just a few yards from where the python had retreated to. She walked in; wings spread in typical fashion, giving the impression of intimidating size, and gave the dead goose a few solid talon grasps. We were hoping that she would be able to take off with the goose and head for one of the nearby Leadwood trees, but alas the goose was beyond her carrying ability. After a few failed attempts at taking off she resorted to dragging the goose to a nearby Mopani Tree. Once she was in the shade of the Mopani Tree, comfortable enough with the cover she had, she began to pluck the goose of its feathers. We then repositioned the vehicle in order to best see her as she began her opportunistic meal. Having spent over an hour observing these phenomenal events it was with reluctance that we decided, with the distant roaring of lions, to leave this enigmatic predator to enjoy its hard earned meal in peace as we headed off to find the lions we had initially started the morning off tracking. This was certainly one of the most unusual sightings I have witnessed and one that, as a group, we will cherish and relive through the images we captured. I hope to see you one day in the magical Linyanti wilderness of Botswana. 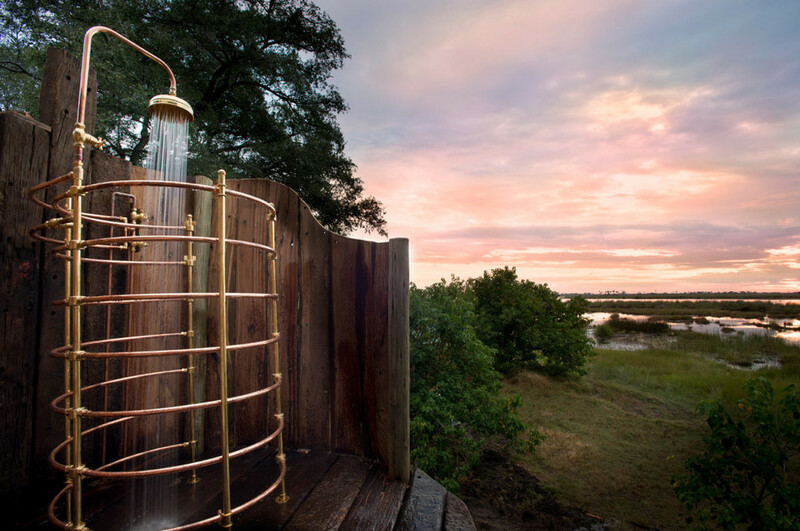 Stay: Greg’s clients were staying at the ultra luxurious Zarafa Dhow Suites, part of the Great Plains Conservation Group, with six different camps in Botswana. The Zarafa concession in the Selinda Reserve in northern Botswana offers incredible game viewing. The Dhow Suites, a private villa with two lavish suites, is perfect for a family or a group of friends, sleeping up to four. With two lavish bedrooms on either side of a sumptuous lounge and dining room, the ambience is one of complete harmony with nature, with breathtaking, elevated views out over the Zibadianja Lagoon. A multi-level deck, with a pool, adds to the palatial expanse of living space, which has been inspired by the miracle of wild Africa. 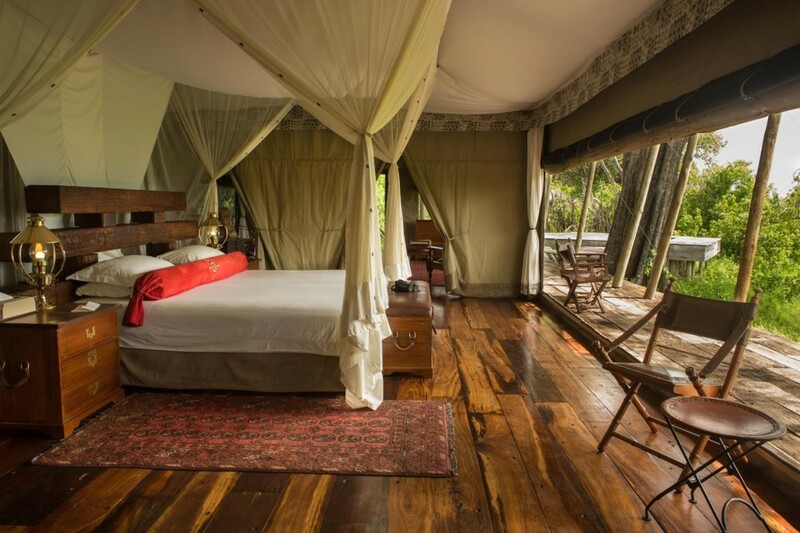 Another option nearby is the Zarafa camp with 4 tented villas and the option to accommodate 8 guests.